Ultrasound imaging is fast, painless, non-invasive, and easy. It is an excellent way to evaluate a fetus, to examine internal organs, to guide needle biopsies, and to diagnose vascular problems. 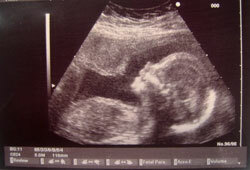 Ultrasound, also called sonography, uses high-frequency sound waves to show real-time visual images. Echoes are produced as sound waves travel through the body, which identify the distance and size of an object. Ultrasound scanners have a video display screen, a computer, and a transducer. The transducer sends sound waves through the body, the computer receives these waves, and the screen displays them. Images from the exam will appear on screen and can be reviewed as they are taken.